Having passed up various opportunities to buy earlier editions (foolishly, as regards the potential resale value of some of these bottlings), I was finally swayed by the shift from the standard black bottle to this (so far one-off) white frosted version, which I confess I prefer, and the continual ratcheting up of the parts per million (ppm) of phenols (broadly equating to “peatiness”). Octomore 4.2 weighs in at 167ppm, which for those with no reference point makes it three to four times as heavily peated as the traditional heavyweights of Islay: Laphroaig, Lagavulin and Ardbeg. 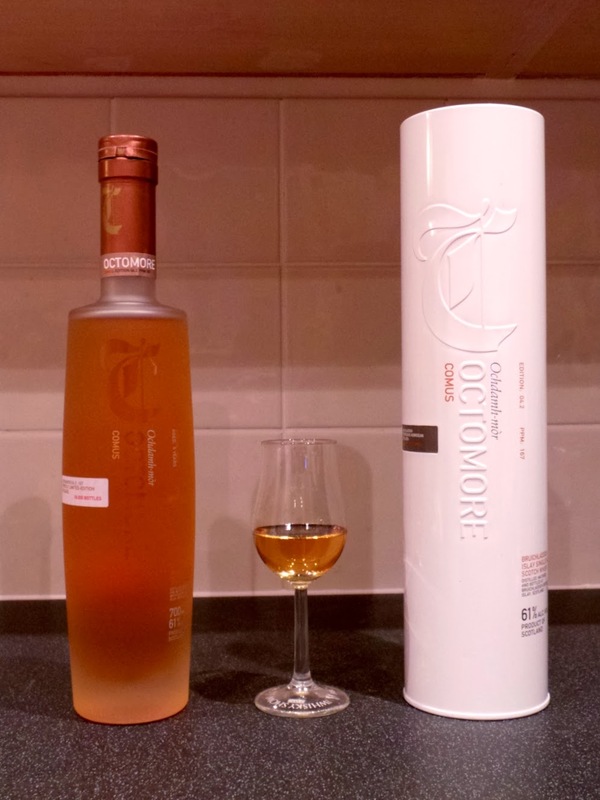 And while it’s no longer the most heavily peated of its breed – Octomore 5.1 hit 169ppm – that’s still between 50 and 100 times peatier than Scotch single malt favourites such as Glenmorangie, Macallan and Glenfiddich (see here)! In practice, Octomore’s peat doesn’t register perceptually quite as high on the Richter scale as its volcanic phenols imply. Indeed, as with another bottling I’ve tried the peat is pervasive but somehow tamer than you’d imagine; smouldering embers rather than an unrestrained peat-fuelled bonfire. The Sauternes cask softens the impact a little, layering on an unexpected roundness and notes of honeysuckle and agave nectar alongside some light oak and fleeting citrus notes. Volcanic, definitely, but more Etna than Vesuvius. Bruichladdich has released new editions (“editions” seems more appropriate than “expressions”) of Octomore on a semi-regular basis since its Octomore Futures 1st Release in 2008 and the first proper version, Octomore 1.1, in 2009. All have varied a little in formulation and conditioning and can be expected to continue doing so. Meanwhile, older versions are starting to come to market, starting with a 10 year old from the original Futures formulation of 81ppm. Octomore is already a spectacular beast so its ongoing evolution will be well worth watching. If you haven’t finished your Comus, I’d love to wangle a dram if possible…!